After a back injury (and, you know, winter) seriously knocked me off my healthy-living game, I was excited to get back into a good routine with help from Abigail Keeso and That Clean Life! Abigail is running a two-week clean-eating challenge this month, and after week one, I’m already feeling better. 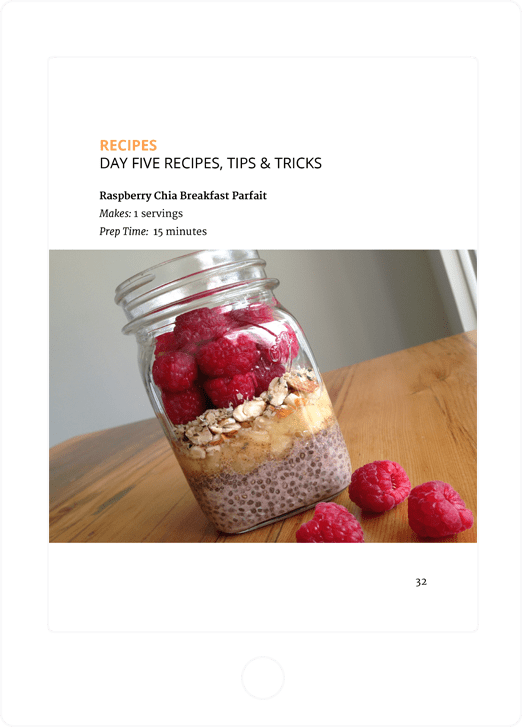 The program consists of grocery lists, recipes, tips and tricks to help you integrate clean eating into your routine. Abigail is great about making the recipes portable (JAR SALADS PREACH), but as she says in the challenge, this is not something you want to take on if you don’t have time to cook and grocery shop. The recipes are easy, but they do require you to be a little more mindful about spending time on what you eat—this isn’t something you want to do when you have a lot of travel coming up. But once you’ve mastered the simple (and delicious) meals, they’re easy to work into your routine. It’s funny how little you’ll miss certain things. One of my favourite recipes is a healthier take on something I make for myself often—scrambled eggs, tomato and avocado on toast. Abigail eliminates the butter, but with the creamy avocado (and the almond milk she adds to the eggs), you don’t miss it at all—in fact, the flavours of the ingredients stand out more sharply without the fatty spread. I was concerned about taking on the challenge as a vegetarian—many of Abigail’s recipes involve meat or fish—but she assured me that vegetables could be easily substituted in all the recipes, and there are suggested subs in each one, which made switching it out easy. I know that these recipes will be sticking around my routine long after this challenge is done. The Kale, Lentil and Sweet Potato Salad and the Clean Cobb Salad Jar are especially ideal for someone who works late and needs to be able to integrate clean eating into a less-than-predictable schedule. And, the plan consists of using leftovers throughout the week, so no food goes to waste and the cooking requirements aren’t too daunting. In terms of how I was feeling, what struck me most was how much less I was thinking about food this week. Maybe it was the planning, maybe it was eating meals that were healthier and more filling, but I didn’t find myself craving mid-afternoon snacks the way I usually do. That being said, I wasn’t happily munching away on kale without some regret: While the plan integrates a lot of protein options, I was craving gooey cheese like crazy. It’s not totally painless (after all, bad habits are hard to break), but so far I’m feeling like I have the tools to keep up some of these healthier choices once these two weeks are over! So good to hear it’s working for you! I’ve heard the first couple of days of clean eating can be the toughest and you’re sailing through! Yay you!